Click on the button above to download Google+ in the App Store and start building your communities! Something else teachers will want to be aware of is Collections. Collections are similar to Communties, but instead of being a group of people, it is more a group of ideas. Collections are run by one person who shares their ideas on a topic. I followed a Music Technology and Music Teacher Resources Collection. Collections are great to follow because they are ways for passionate and knowledgeable teachers to share their ideas. Take a look at the picture on the right to see what a Collection looks like! Collections look much like Communities, but you will note on this page that Matthew Topping is the creator and other people are followers. He is the only one who posts on this page, but shares many ideas he has discovered from other teachers! Click on the button below to view Matthe Topping's Collection and start searching for others! 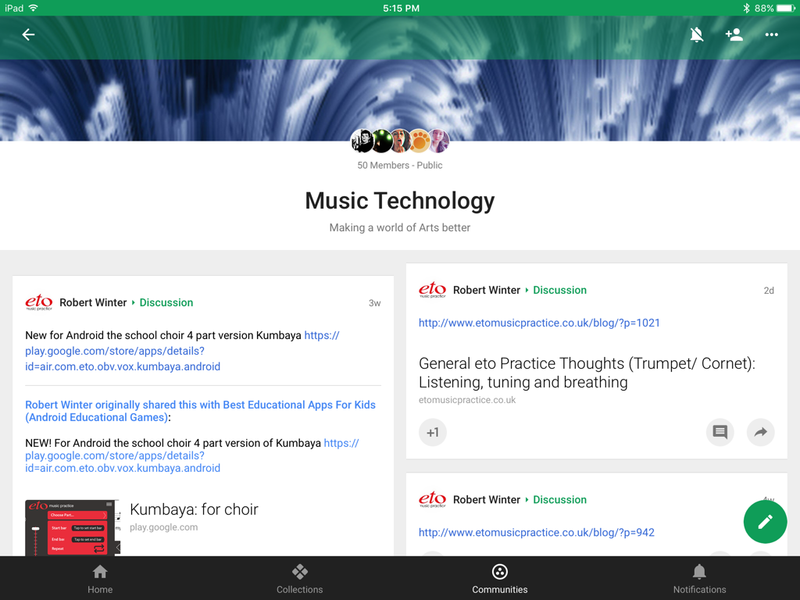 Google+ is a great educational resource for teachers to use. I recently started looking through this resource and found many communities that will help me as a music educator. 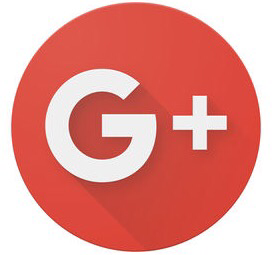 Communities are pages through the Google+ app that are about a certain topic that people can post resources to. These pages can be joined by people who are into a similar content area or who are interested in specific topics. Personally, as a music educator, I joined a Music Technology and Music Educators Community for a start. What I loved about these pages was the ability of several teachers and technicians to share ideas with each other. Google+ is much like Pinterest but on a more specific level. People were sharing projects, apps, and ideas they were using in their classrooms to inspire other teachers in their lesson planning. I particularly like the fact that teachers were largely talking about integrating technology into the classrooms. Music is starting to head in this direction as technology is used more often than not to enhance musical experiences no matter what genre is being played. To the right I have include a picture of the Music Technology Community I am a part of to share an idea of what this site looks like. As you can see from this quick look, this is a fairly new and small community, but it has lots of valuable information on it. People are sharing articles, apps, and other resources that they use to enhance music through the use of technology. As a teacher, it is important for me to keep my eyes open to lots of new opportunities and new ideas for teaching my students how to engage in music. This page is a quick way for me to check and see what kind of things other teachers are doing in their music classes that utilize technology. Click on the button below to take a look at the Music Technology Community and start exploring other communities! Google+ is a great, professional way for teachers to find ideas and look into them. It is a collection of good thoughts and creative projects that people can use. 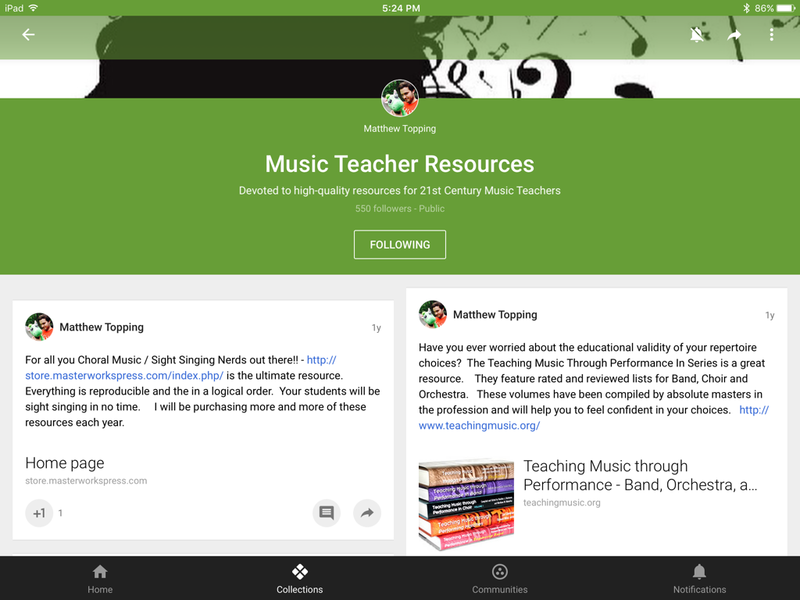 As a music educator, I found that there were not a whole lot of music education Communities and Collections, but that can quickly change as teachers begin finding out what resources they can find on Google+. One general thing to be cautious of when using this site; make sure the Collections and Communities you follow are up to date! I clicked on a few and found that the last post had been made over 3 years ago. Find pages that have been posted into within the last year. This way you ensure you are staying up to date with the latest ideas floating around. Overall, Google+ is a incredible resource for teachers to use when trying to find creative and new ideas to use in the classroom. Take time to check it out!